This option provides a prefix and related information in Router Advertisement messages. This is the longest and most complex of the options, as you can see in Table 117 and Figure 166. Type: Identifies the ICMPv6 option type. For the Prefix Information option, the value is 3. Length: The length of the entire option (including the Type and Length fields), expressed in units of 8 octets (64 bits). The Prefix Information option is fixed in size at 32 bytes, so the value of the Length field is 4. 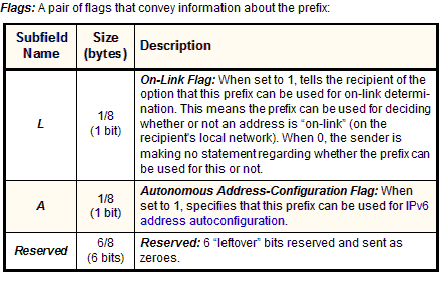 Prefix Length: The number of bits in the Prefix field (below) that are considered part of the network identifier (the remainder are used for the host identifier and ignored). 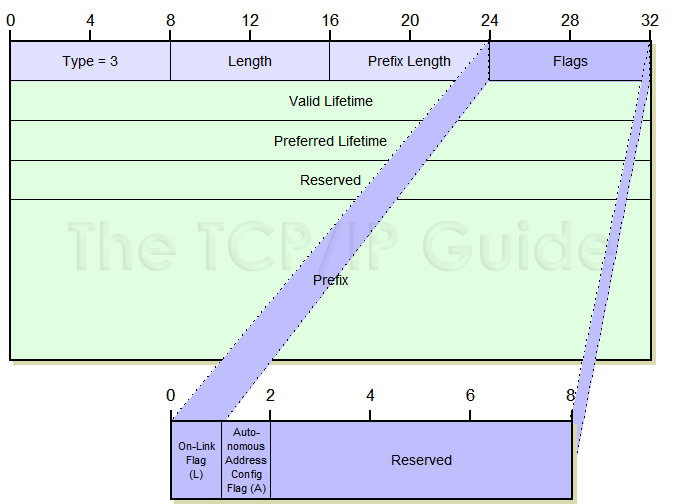 See this overview discussion of IPv6 address notation for details on prefix lengths. Valid Lifetime: The amount of time, in seconds, that the recipient of the message containing this option should consider the prefix valid for purposes of on-link determination (see description of the L flag just above). A value of all 1s means infinity (forever). Preferred Lifetime: When the recipient of this prefix uses it to automatically generate addresses using address autoconfiguration, specifies the amount of time, in seconds, that such addresses remain preferred (meaning, valid and freely usable). A value of all 1s means infinity (forever). Reserved: 4 unused bytes sent as zeroes. Prefix: The prefix being communicated from the router to the host in the Router Advertisement message. The Prefix Length field indicates how many of the 128 bits in this field are significant (part of the network ID). Only these bits are placed in the Prefix field, the remaining bits are cleared to zero.